Human settlements have had the problem of disposing of their dead from earliest times. When the Romans arrived in Exeter during AD49, they built a fort and civic buildings. It was their habit, to bury their dead outside of their settlements, often on the edge of a road. Two such Roman cemeteries have been discovered in Exeter, one on the old site of the Valiant Soldier in Magdalen Street, now a car park, and the second near the Duke of York in Sidwell Street. It wasn't until the Romans left, early in the fifth century, that the central part of Exeter, now Cathedral Yard received its first Christian burials. The excavation of the Roman bath house in the early 1970's found pre-Saxon, Saxon and mediaeval burials at different layers on the site. See Roman Bathhouse. The building of the Norman cathedral consolidated Cathedral Yard as a burial ground for Exeter. However, many of the small churches in the city had interments, either in small yards or in the church itself. The last burial in Bartholomew Yard by John Gendall. Notice the entrance building on the boundary. Opposite the entrance of Friernhay Street onto Bartholomew Street West, where the commemorative plaque is on the boundary wall of the burial yard, there was a small brick building with an arched entrance to the yard in the centre. One side had a room for clergyman to register burials and the other for the gravedigger's tools. The last burial in the yard was of a cholera victim in 1832, at midnight under a bright moon. When the grave was filled, the gravedigger placed over it a blue stone from the oldest grave in the yard, of Salathiel Jennings. Two hundred years later, Bartholomew's Yard was also suffering from overcrowding. The 1832 cholera outbreak had put a real strain on the many small burial yards around the city, Bartholomew's Yard was almost full and a corner of Bury Meadow was used for a mass grave. 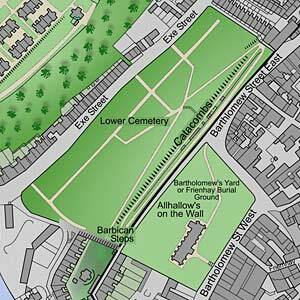 The Improvement Commission employed Thomas Whitaker to design a cemetery and catacombs to be built below Bartholomew's Yard, below the city wall. Henry Hooper was engaged to build the catacombs between 1835 and 1837 at a cost of £6,000. The Lower Cemetery, on the slope of the hill below the catacombs had a dividing wall to keep dissenters away from true believers - Bishop Phillpotts, refused to consecrate the dissenters section, when he opened the cemetery. No wonder he was one of the most disliked, of Exeter's Bishops. The cemetery had 17,552 interments before it was closed in 1949, while the catacombs managed 16 interments before it was abandoned as a failure. See Catacombs and Lower Cemetery History. It was obvious that the new cemetery would not be sufficient and on 26th May 1866. Higher Cemetery was consecrated by the former Bishop of Colombo the Right Reverend James Chapman, as Bishop Philpott's was indisposed. The turn out was poor as the weather was'very disagreeable'. Robert Veitch and Son were employed to landscape the 6 acres of cemetery, and a lodge and two chapels designed by Edward Ashworth (buried in the cemetery) were built of Heavitree stone. Four and half acres were set aside for the established church and one and a half for dissenters. Higher Cemetery contains two War Memorials, one oval shaped the First World War in front of one of the chapels and one in the North East corner of the cemetery for the Second World War. There are a number of graves of German airmen, shot down over England, as well as servicemen from Southern Rhodesia, Canada, Newfoundland, New Zealand and Poland. By the Long Valley Path there can be found three rows of graves of victims of the Exeter blitz on the 24th April the 4th May and the 30th December 1942. See World War Memorials for all the war memorials including those in Higher Cemetery. This cemetery at Landhayes was opened in 1877, by Bishop Temple, who, as did his son William Temple, became Archbishop of Canterbury. 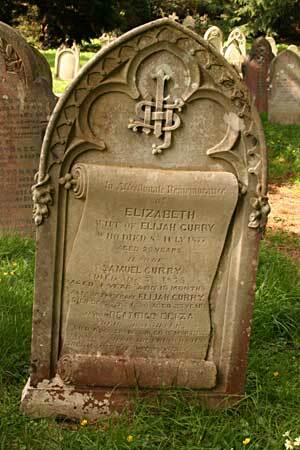 The first burial was that of Elizabeth Curry who died at the age of 29. The cemetery also contains the grave of the Victoria Cross holder, George Hollis, who died in 1879 and Frank Shooter, the Hero of the Exe who died in 1917. This little burial ground can be found in Magdalen Street. See Jews Burial Ground for photos and history. Exwick Mill was run and occupied by the Mallett family for a 100 years. William Rice Mallett had been a miller with his father, John Mallett at Thorveton Mill, when, after is father's death he moved to Exwick Mill in 1859. 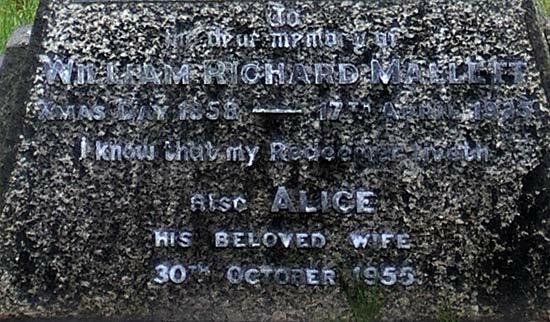 His son, William Richard was born on 25th December 1858. William Richard followed his father into the business, age 16, and by 1885 was taking more responsibility in the business. It was William Richard was rebuilt the mill in 1888, to the building that exists today. He was a national expert on mills and milling, publishing papers on wheat and flour production and water power. 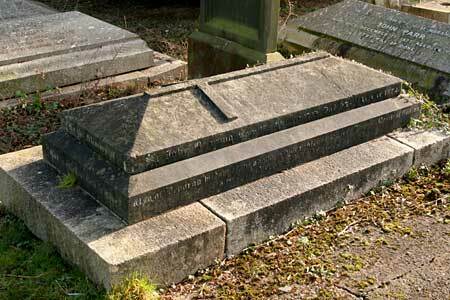 He died in 1935 leaving £66,076 (£3 million at todays prices). Born in May 1861, Widgery's father was the artist William Widgery. The young Widgery trained at Exeter School of Art and then the South Kensington Museum School before travelling to Antwerp to study under Charles Verlat at the National Art School. Upon his return to England, he studied at Professor Hubert von Herkomer's School in Hertfordshire. Widgery made a living in Exeter, becoming noted for his landscapes of Dartmoor. He was elected to the council in 1898, becoming the Mayor in 1904 and an Alderman in 1909. He was a founder member of the Exeter Pictorial Society in 1909. He died, aged 80 in 1942. His paintings are still sought after, commanding respectable prices in commercial art galleries. See Widgery. The small Allhallows, Goldsmith Street church is unknown to many in Exeter. It stood on the corner of Goldsmith and High Street, a place now occupied by H Samuel, the jewellers. The church was removed in 1906 for road widening. 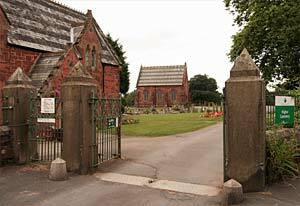 The Council paid £8 5s for the burials in the church to be moved to Higher Cemetery in April 1906. The remains included those of Stephen Vilvaine died 1556, Simon Gandy, died 1678, Thomas Bampfylde died 1656, and Peter Vilvaine, died 1602 the father of Dr Vilvaine who founded a 'common brewhouse', that eventually became the City Brewery. THE NATIONAL TRUST OF S.A.
Born in Suffolk, Thomas Whistler emigrated to South Australia in 1840 at the age of 30. He purchased 420 acres of land at a £1 an acre, near the embryonic Adelaide. He drew up a town plan and started to sell blocks of his land, making a fortune in the process. The new three street settlement was named Unley, along with Unley Park. In 1856 he returned with his housekeeper, Mrs Elizabeth Bayley, to England and settled at in Exeter. He died on 1st August 1896. Unley is now a suburb of Adelaide, with a population of 37,000. 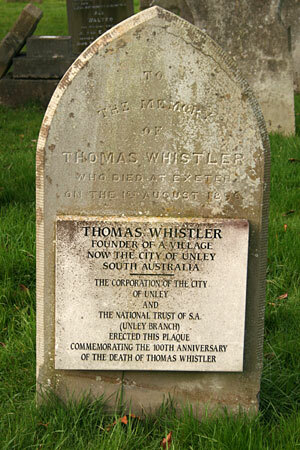 In 1999 a delegation from Unley visited Exeter, and the Deputy Mayor of Unley unveiled a plaque on Whistler's gravestone. The tragedy of the Theatre Royal fire is familiar to many in Exeter. The fire on the 5th September 1887, claimed 186 victims. Many of the dead could not be identified, so a mass grave was dug for their interment. 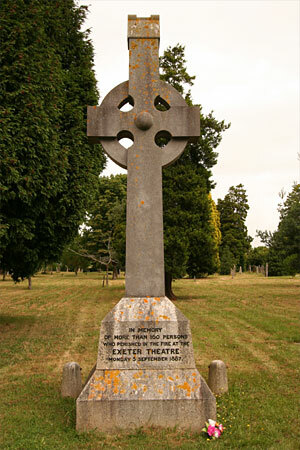 A large memorial cross, carved by Harry Hems was placed over the grave. Alongside the Theatre Royal Fire Memorial can be found this gravestone to Bombardier Francis Scattergood. 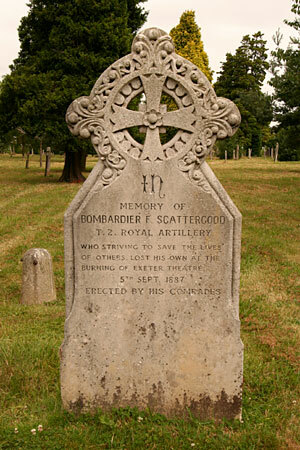 A 25 year old soldier in the Royal Artillery, Scattergood was at the performance of Romany Rye that turned to a fiery tragedy in 1887. He died trying to save many others from the inferno, and was hailed a hero. His gravestone was refurbished and rededicated in June 1992. Two headstones for members of the Homeguard who were killed on 5th May 1942. 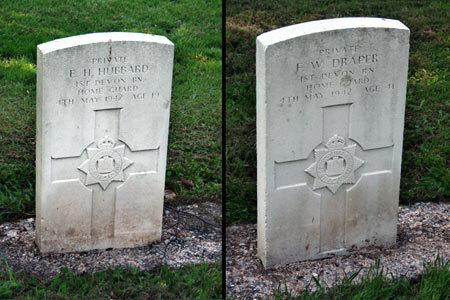 Private E H Hubbard was 19, and Private F W Draper was 44; both were members of the 1st Battalion (Loyal City of Exeter) Devon Home Guard serving in the Company HQ. During the deprivations of the Great War, Exeter had its own minor tragedy that is still remembered. The tram crash of 1917 had a single victim, Mary Findlay. Her memorial is placed flat as it has become detached from its base. See Tram Crash. 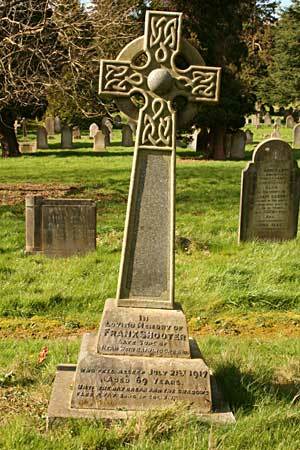 One of two graves in Exeter for winners of the Victoria Cross. Corporal William Oxenham, as a member of the 32nd Regiment, won his award for bravery on 30th June 1857 when he rescued a man while under fire at Lucknow, during the Indian Mutiny. He died in 1875. Both this grave, and the grave of George Hollis VC still have poppy wreaths in place. 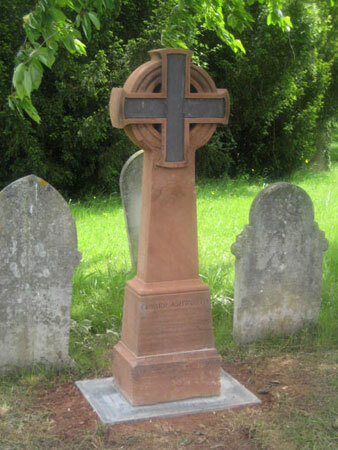 Two Exeter victims of the sinking of the Titanic in 1912 are commemorated in Higher Cemetery. 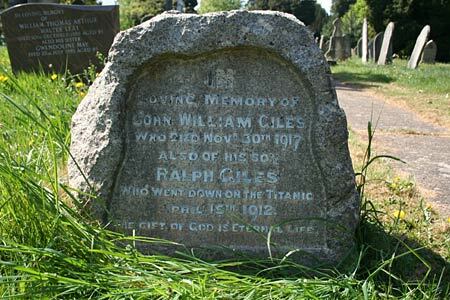 Ralph Giles was buried at Fairview Cemetery, Halifax, Nova Scotia, but is remembered on his father's gravestone, who died in 1917. Giles was travelling to America on business. 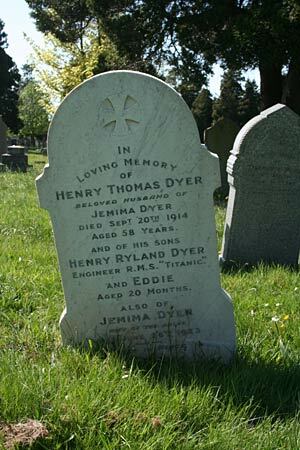 Henry Ryland Dyer signed on as an engineer on the Titanic at a monthly wage of ?11. 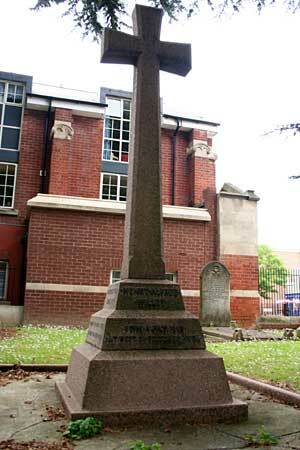 More on Exeter's Titanic victims. The beautifully crafted memorial to Harry Hems, the noted 19th century church restorer, and stone and wood carver. Hems arrived in Exeter during 1866 and immediately started work producing carvings for the Royal Albert Memorial Museum. He had a purpose built workshop built in Longbrook Street, where high quality carvings for churches all over the country were produced. 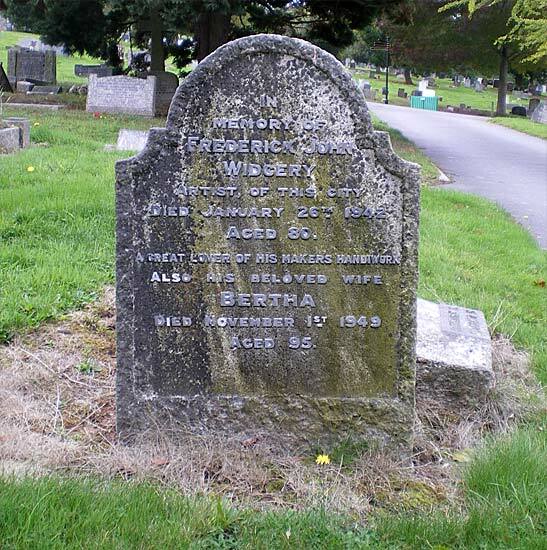 Harry Hems died on 5th January 1916. The inscription has been enlarged for clarity. Born in Larkbeare in 1792, Sir John Bowring died on 23rd November 1872. He travelled widely, becoming fluent in several languages. He was then appointed the 4th Governor of Hong Kong in 1854. He is also remembered for inventing the Florin, based on 2 shillings (10 pence), and was a keen supporter of a decimal coin system, a full 100 years before decimalisation. Bowring was a founder of the Devonshire Association for the Advancement of Science, Literature and Arts and was its first President in 1862. His tombstone has the words 'In the Cross of Christ I Glory' from the hymn that he penned, after seeing a cross on a fire gutted church on the shore, while sailing past Macao, China. It was in 1845 that Benjamin Salter sold his interest in the City Brewery to John Evomy Norman. Walter Pring, the second player in the formation of Norman and Pring became a partner in 1865. 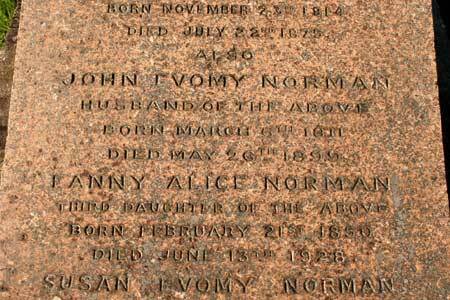 Norman was born on 6th March 1811 and died on 26th May 1899. His son, also John Evomy took over the brewery after his father's death. FJ1, Exeter's first car to be registered in 1903 belonged to the younger John Evomy. 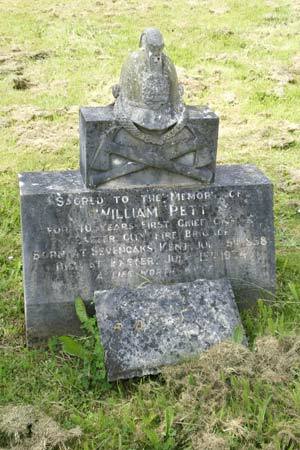 In the cemetery that contains the remains of so many who died in the Theatre Royal fire can be found the grave of William Pett, the man who was appointed as the first, Exeter City Fire Brigade, Superintendent, an appointment created to prevent another tragedy on that scale. He took charge on 1 March 1888 at a salary of £2 per week. Pett would introduce the latest ideas in fire fighting at the time, and held the job for almost 40 years. He retired in May 1927 and died on the 15 July 1934. His gravestone is one that well befits a fire fighter, with a fine fireman's helmet and crossed axes above the inscription. Many of the parks of Exeter were landscaped by the nurseries founded by John Veitch and his son James. James' two sons, also James and Robert Toswill had taken over their fathers nursery business on his death. The business expanded, and in 1853 James founded James Veitch and Sons in Kings Road, Chelsea. On 1863 on the death of his father, the Chelsea business became independent. After James died in 1869, his son Harry went on to found the Chelsea Flower Show. Meanwhile, Robert Toswill Veitch continued to run the Veitch nurseries which relocated to New North Road in 1864 and landscape many Exeter parks as well as the Higher Cemetery. 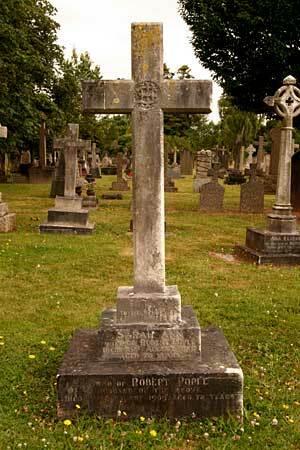 He was laid to rest during 1885 in the old St Leonards cemetery which is an annexe of the Higher Cemetery. It is fitting that the architect of the two lodges and chapel in the Higher Cemetery, Edward Ashworth should be buried within yards of his creations. 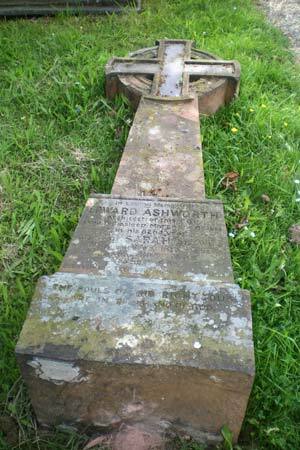 Ashworth, born in 1814, was considered to be the West Country's leading ecclesiastical architects and had been responsible for the restoration of Wynards Almshouses in 1863 and the design of St Nicholas Church, opposite St Nicholas Priory. He died in 1896. His memorial had become detached from its base (right). The City Cemeteries Department have restored the headstone, to its former glory - well done lads! Thanks to Ian Quance for the photo left. 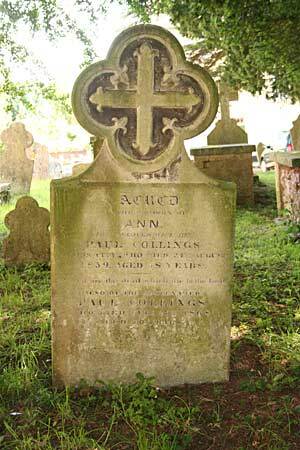 Whatever the truth, the gravestone is a reminder of Topsham's links with the sea. The stone has been moved from its original position to enable grass cutting in the cemetery. 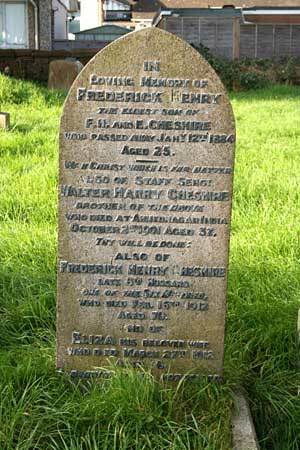 Lt Frederick Henry Cheshire was born in Whipton in 1833. He was a member of the 8th Hussars who made that fateful charge at Balaclava on the 27th April 1854, when he lost a leg in the action. The Light Brigade consisted of the 8th and 11th Hussars, 4th and 13th Light Dragoons and the 17th Lancers, under the command of Major General the Earl of Cardigan. The action was a disaster and 118 men were killed, 127 wounded, and 362 horses lost. There is a second survivor from the Charge of the Light Brigade with connections to Exeter. Trumpeter James Donoghue enlisted in 1848 and sailed for the Crimea on the H T Medora in April 1854. He had his horse shot from under him in the charge. After he retired, he became the Band Master of the 1st (Exeter and South Devon) Volunteer Regiment and lived in Blackboy Road. He is buried in Warrington. In a world dominated by men, Charlotte Treadwin carved herself a niche in the world of Devon, and especially, Honiton lace. Born in 1820 in Dulverton, she was apprenticed as a dressmaker, and quickly developed an interest in lace making. Her knowledge on the history of Honiton lace became so extensive that she presented a paper to the Devonshire Association in 1883 and wrote a book entitled "Antique Point and Honiton Lace." She had premises at 5 Cathedral Close, where she built up a clientel that included Queen Victoria and the Princess of Wales, and exhibited at the Great Exhibition. 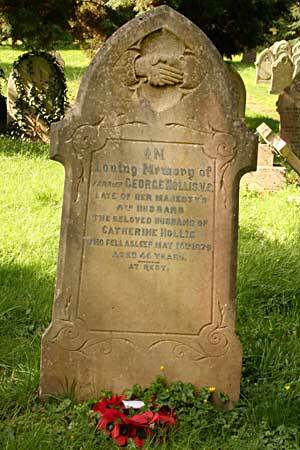 She died on the 6 December 1890, aged 69. 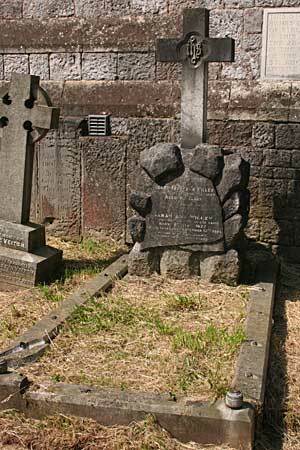 On the 18 March 2009, the Lord Mayor Paul Smith unveiled a new headstone to replace the badly damaged stone. 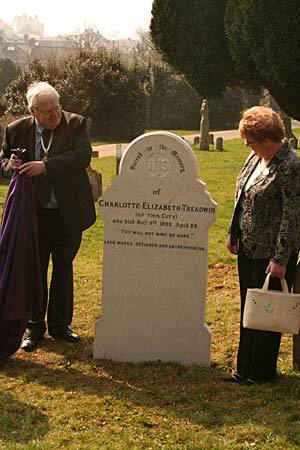 The new gravestone was initiated by Carol McFadzean and the Devon Lace Teachers. It has one extra line "Lace maker, designer and entrepreneur" - a fitting tribute to a remarkable lady. 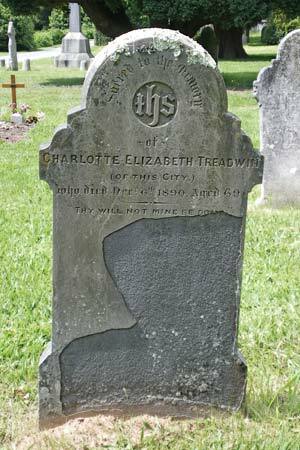 See Charlotte Treadwin for a longer biography. 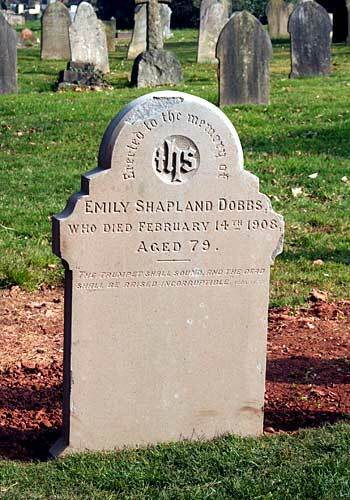 Emily Dobbs was born on 2 November 1828 in Kings Brompton, the 6th child of seven and the youngest sister of Mrs Charlotte Treadwin, opposite. She remained with her mother until she was about thirty. In 1861 she was listed at Chulmleigh running a Honiton Lace Manufactory, possibly as a manufacturing outpost for her sister's business in Exeter. By 1871 she was living with Charlotte at 5 Cathedral Close, with no occupation. 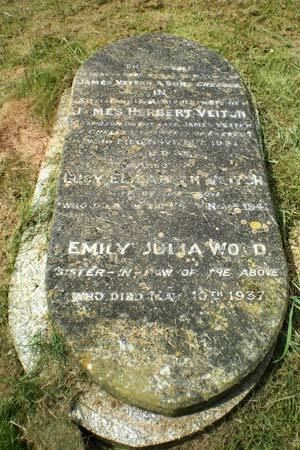 On her death on 14 February 1908 she was a spinster living at 61 St David's Hill; Emily left £200 to family members. 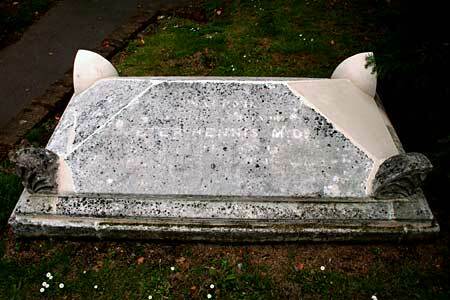 The grave stone was cleaned and restored at the same as her sisters grave stone was replaced due to weathering. With thanks to Carol McFadzean for the biographical details of Emily's life. Dr Hennis brought relief and succour to the people of the West Quarter during the outbreak of cholera in 1832. 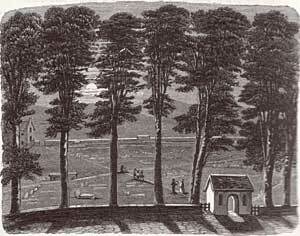 The next year he became involved in a dispute with Sir John Jeffcott, which led to a duel at Haldon Racecourse. Hennis was hit by a bullet in the chest and died a week later. Thousands turned out for his funeral cortege to St Sidwell's. He is the last known victim of a duel in Devon. See the last duel for the full story. Henry Frederick Willey was born September 1830 in St Sidwells. He joined Vicary's an engineering company. When Mr Vicary died, Willey went into partnership with Mr Ford to found Willey and Ford, manufacturers of gas meters. The partnership dissolved leaving Willey to continue with Willey and Co. Within a short time, Willeys were the main supplier of gas equipment, domestic and commercial in the country. He was Mayor of Exeter in 1892. 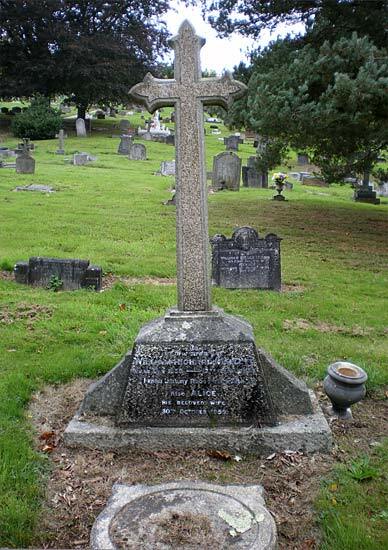 Henry Frederick Willey died in 1894 and was buried in St David's Churchyard, left. A family grave which includes Henry's son Henry Alfred Willey can be found in St Thomas' Churchyard, right. Paul Collings was landlord of the Black Horse in Longbrook Street and, later, the Queen's Hotel, Queen's Street. He had an exceptional gift with horses, and ran three coach services out of Exeter, along with a livery and coach hire business. He was Spanish by birth, and was attached to Sir Harry Smith as a servant at Waterloo, walking the battlefield the day after the famous victory. He considered himself to be English, and was very proud of his adoptive country. He died in 1868 aged about 70. The 19th Century was a period when several ironworks were established in Exeter. 'Iron Sam' Kingdon expanded his father's business interests in the city through his iron foundry in Waterbeer Street. It became a major supplier of heating systems for the large country houses around Devon and also for heating glasshouses for nurseries, including Kew Gardens. He sold the foundry to Garton and Jarvis, which became Garton and King. In retirement, 'Iron Sam' lived in Duryard Lodge, which was sold after his death to become Streatham Hall. 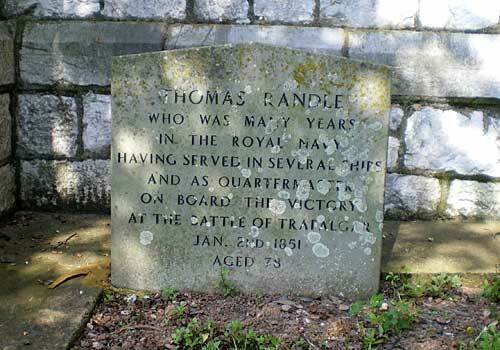 He died in January 1854 and was buried in St David's Churchyard. 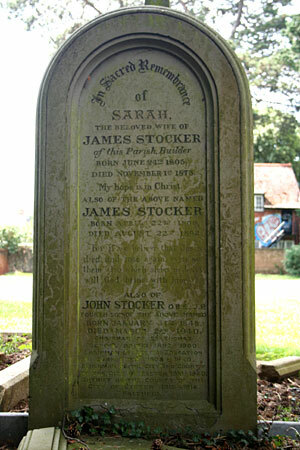 John Stocker was born in St Thomas and lived in Cowick Street. He always took an interest in education and was chair of the St Thomas School Board and the Exeter Education Committee for many years. The St Thomas Boys School, built in 1901 at the bottom of Dunsford Road, was renamed the John Stocker School in 1921. John Stocker laid the foundation stone for a new school in 1936 after the previous building was damaged in a fire. It has since become the John Stocker Middle School. 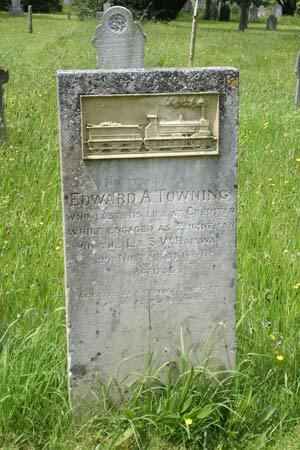 An engine driver, Edward 'Teddy' Towning died in an accident at Crediton Station on 29th November, 1889, aged 35. The train was an up goods from Yeoford to Exeter - he told his fireman "I'll put a little drop of oil on" as the engine was still moving, slipped, and fell under the wheels. He died instantly, suffering two badly fractured thighs, and left a widow and five children. 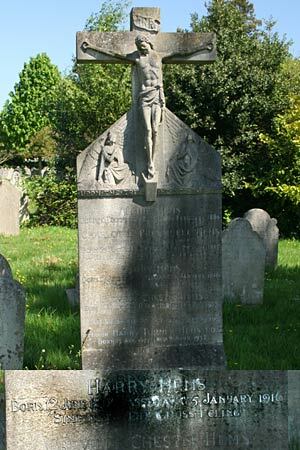 The gravestone has a well preserved image of a 0-6-0 L&SWR engine, carefully carved in the upper panel. 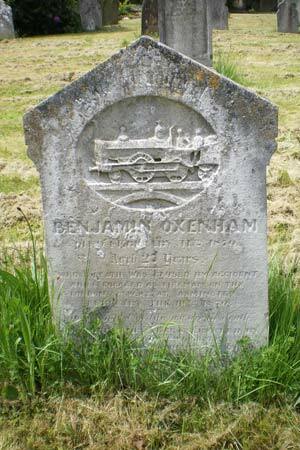 Benjamin Oxenham was killed on 10 February 1870, aged 23. 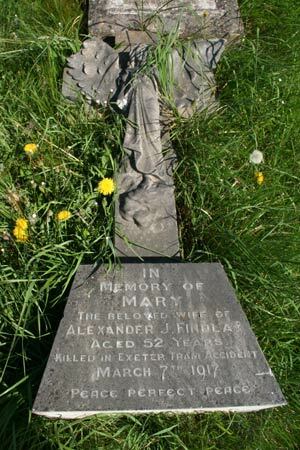 The inscription states "Whose death was caused by accident while engaged as a fireman on the London & S W Railway at Aximinster." Oxenham slipped off the train while sanding the rails and fractured his skull. He died the next day in the Devon and Exeter Hospital. 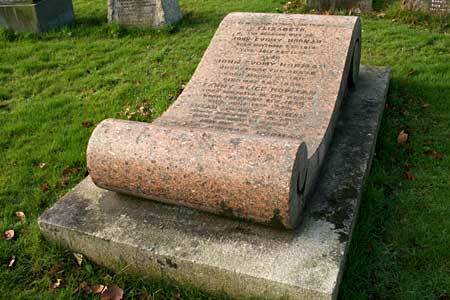 The sculpted 2-4-0 engine is more badly worn than that of Towning's gravestone. 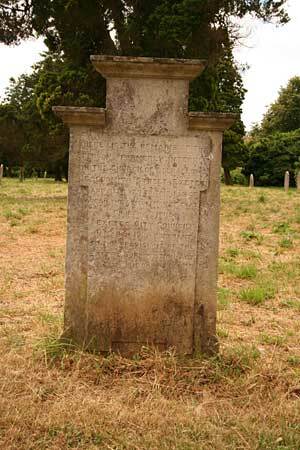 The first burial in Exwick Cemetery was that of Elizabeth Curry who died at the age of 29, and, as the first, was given a free tombstone. Sadly, the next year, her small son was buried next to her and two years later, her husband. The burial of Elizabeth Curry was conducted by Bishop Temple, who would go on to become Archbishop of Canterbury. 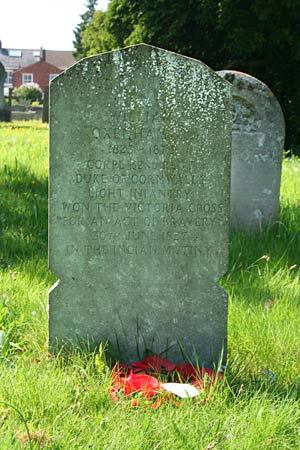 One of only two holders of the Victoria Cross to be interred in an Exeter Cemetery, George Hollis enlisted as a farrier in the 8th Hussars (King's Royal Irish). With Captain Heneage, Sergeant Ward and Private Pearson, he charged through the enemy camp, on 17 June 1858 at Gwalior India, into two batteries, and captured the enemy guns, all under fire from the fort and town. After a ballot, of the regiment, which was unanimous, the four men were chosen to receive the VC. At the time of his death, he lived in Cowick Street and worked for Sanders and Snow, wine merchants of Gandy Street. 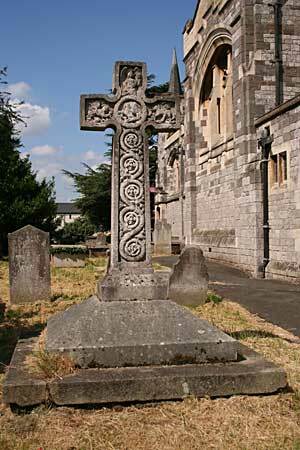 He was born in Chipping Sodbury in 1833 and died on 16th May 1879. Frank Shooter was known as the 'Hero of the Exe'. He was the Bathing Constable and Superintendent at the Head Weir bathing area. During his time in the job he saved over 200 people from drowning and taught thousands to swim. In 1886 he issued a challenge to any boy of 12 years or younger to race 500 yards for a £20 prize. Shooter was awarded a silver and bronze medal and four clasps by the Royal Humane Society for his life saving exploits. When he died in 1917 the Flying Post wrote "Amidst manifestations of deep sympathy and regret the remains of Mr Frank Shooter, for 37 years superintendent of Head Wear Bathing Ground, Exeter, were laid to rest in a walled grave at Exwick Cemetery yesterday afternoon, within sight of the place he loved so well, and where the best part of his life was spent." Walter Henry Palmer (235366) was a Leading Seaman on HMS Indefatigable, who was killed at the Battle of Jutland on 31 May 1916, when she received a direct hit from the German Von der Tann. 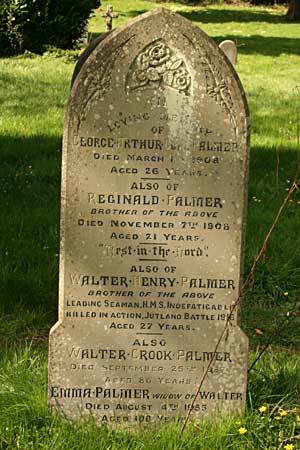 He was the son of Walter and Emma Palmer of Tiverton and had been born in Silverton on 1 February 1889. There were 57 officers and 960 men of the ship's crew killed that day. 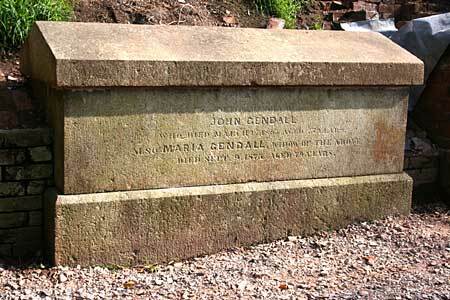 John Gendall was born on Exe Island in 1789. He gained employment in London as an artist, and gained a reputation for the quality of his aquatint engravings and coloured lithographs. After several years, he returned to Exeter and set up, in Mol's Coffee House, his studio and carriage painting business. Over the next thirty years, Gendall produced hundreds of drawings of Exeter, especially the many buildings that were demolished in the wake of the Improvement Commission. Without his body of work, the Exeter of the late 18th and early 19th century would be lost. He died in 1865. The son of the composer Samuel Wesley, and grandson of Charles Wesley. John Wesley, the Methodist was his great Uncle. He became a musician, taking a post of organist at Hereford Cathedral in 1832. In 1835, he became organist at Exeter Cathedral where he remained until 1841, at a time when Bishop Philpotts held sway. His move away from Exeter was probably hastened by running away to marry the Dean's sister. He took later posts at Leeds Parish Church, and Winchester and Gloucester Cathedrals. He composed the anthems Thou wilt keep him in perfect peace, Blessed be the God and Father, and The Wilderness and Ascribe unto the Lord. 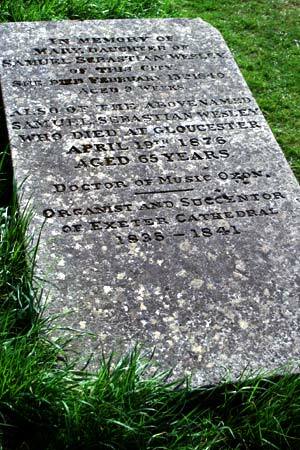 He died in Gloucester, but was buried in Exeter. Exeter City Council Bereavement Services - also gives links to further information about council run cemeteries. With thanks to Frank Potter who has pointed out so many interesting graves in Higher Cemetery. 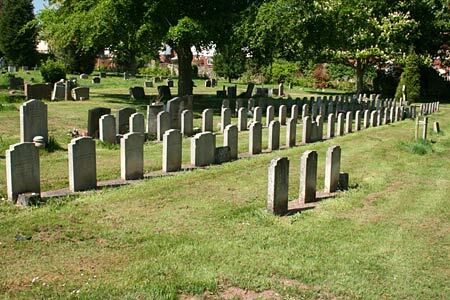 List of Graves can be found in the Index Card list from the Bereavement Service where over 100,000 graves in Exeter's three main cemeteries are listed.